A recent project for Active's lineboring team involved realigning a giant monocrane that could only be operated at low speed due to excess vibration. Despite attempts by others to fix the problem the vibration was still happening, and as a result this vital infrastructure project was falling behind schedule. 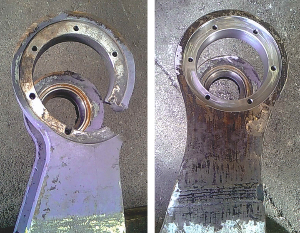 Crane maintenance costs were soaring due to the constant uneven wear to shafts, bearings and housings. Active sent one engineer and specialised kit to site. Over the following four days we found the source of the mis-alignment, restored bores, repaired damaged pins, replaced bearings and got the crane working at its intended speed. This work immediately saved the crane operator many thousands of dollars and helped them regain lost working time. The customer was so pleased with how well the monocrane was now running, they asked Active to realign and rebore their second monocrane to make it run as well as the first. Andrew Balsillie is the Maintenance Superintendant at SteelServ, providing specialist services to New Zealand Steel's Glenbrook steel mill. "We have seen our lineboring costs decrease over the years," Andrew says, "as our maintenance practices have improved and reliability solutions were implemented, with Active's support." A prime example of this cost saving was with SteelServ's ladle carrier frame. It was wearing out bushes and flogging out housings far faster than expected, meaning a lot of expensive downtime taken to weld, rebore, and replace bushes and pins. Active started by taking baseline measurements and right away discovered alignment problems. As a result of re-truing the equipment, the maintenance cycles are now much longer and the lifecycle has been extended. Neil Attwood, one of Active's senior lineboring specialists, says he likes that his work reduces the amount his customers spend with Active. "On most sites we can find immediate cost savings for our customers," he says. "That's one reason why they trust us." SteelServ have also worked with Active to develop a parts register of all the items that Active machines for them, and developed planned maintenance schedules that allow them to forecast their downtime well in advance. Andrew Balsillie believes that when SteelServ align themselves with businesses that can add value in this way, the benefits and rewards are shared. When asked if he's happy to recommend Active Engineering to other people, Andrew's response is: "Without a doubt." Orora Group is a global corporation that offers tailored packaging solutions. 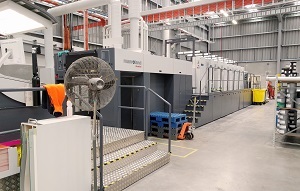 Their large facility at Wiri specialises in the high-volume production of cartons, particularly for the FMCG market. Mark Anderssen is responsible for maintenance in the print department at Orora Cartons. He looks after a significant portfolio of plant and machinery including three large printing presses, die cutters, gluers, clamshell machines, pile turners and guillotines. Active Engineering do all the servicing and maintenance on the printing presses and die cutters as well as machinery repairs as needed. "Active have been instrumental in identifying issues that we have been able to sort out, prior to having a failure," Mark says. "Doing the maintenance on a regular basis as we do, helps with identifying potential breakdowns." Planned maintenance also means that Mark knows months in advance when a machine will be off-line and can build this downtime into the company's production schedule. Active's print team will be on-site as planned, prepared with the right tools, parts and consumables for the job. This has reduced maintenance time and re-visits, and kept costs to a minimum. Mark says he would have no problem recommending Active's print team. "Peter and Bill are very competent engineers and are always prepared to assist where they can." Active's workshop was asked to carry out a world first: designing, building and fitting a blade to a Cat Challenger. Our engineers relish this kind of project because it gives them the chance to work on something unusual and to use all of their technical skills. They also take pride in creating something that no-one else has been able to make before. One of the most urgent jobs the workshop has handled was a newly-broken cake mixer brought in by a frantic woman who had been in the middle of making her daughter’s wedding cake. We were able to fix it on the spot, and the wedding went to schedule. The workshop often carries out repairs to axles and other pivot points. What looks like terminal damage can usually be repaired to new condition.